Perhaps the best measure of a coach is his ability to find diamonds in the rough and polish them into the finished article, and in Julian Nagelsmann, Hoffenheim may well have the best in the business. Nagelsmann celebrated his two-year anniversary as coach of Hoffenheim with a 4-2 win over Mainz on Saturday, which lifted the Sinsheim club to within three points of the European places. A lot has changed since the 30-year-old took charge at the Wirsol Rhein-Neckar-Arena in February 2016 with Die Kraichgauer in the relegation zone, five points adrift of safety. A first tilt at European football followed for the Bundesliga’s youngest ever coach, who ended 2017 as the German Football Manager of the Year. Before Nagelsmann: A Borussia Dortmund youth product, Demirbay’s career had drifted into no-man’s land after leaving Die Schwarzgelben aged 20 in 2013. A fruitless spell at Hamburg followed before the midfielder looked to have found his level in Bundesliga 2 with first Kaiserslautern and then Fortuna Düsseldorf. Ten goals in 25 games were admittedly a good return for the latter in the 2015/16 campaign, but few expected the Ruhr-born Turkey U21 international to blossom into the player he is today. Since Nagelsmann: Demirbay was thrust into the heart of the Hoffenheim midfield beside Germany international Sebastian Rudy, starting 27 games as the club finished the 207/18 campaign in fourth. Demirbay’s wonder-goal in the 1-1 draw at champions Bayern Munich proved he could mix it with the best of them, while it was the left-footer’s injury-time strike against Cologne on the final day which booked the club’s passage into the UEFA Champions League play-off places for the first time in their history. Little wonder he joined Rudy in the Germany set-up last spring. Since Nagelsmann: A battering ram of a striker at 6’4”, many were surprised that Wagner featured in Nagelsman’s plans at all, especially given the coach’s preference for a new age 3-4-2-1 formation, designed to narrow spaces between teammates, since copied far and wide. Nagelsmann knew to look past Wagner’s frame and to his footballing i.q., though, playing him in all but four games as part of an attacking trio, usually with Andrej Kramaric and Nadiem Amiri for company. Wagner repaid the confidence, converting more than 70 percent of his chances and forcing his way into Germany contention. After a team-high five goals in qualifying for the World Cup next summer, Wagner now describes himself as “the best German striker”. If that is indeed the case, he owes Nagelsmann a debt of gratitude. Watch: Wagner: "I'm the best!" Before Nagelsmann: A Cologne academy player, Uth left the Billy Goats in 2012 after failing to break into the first team. He looked to have refined his goalscoring craft in the Netherlands with Heerenveen and Heracles before returning to Germany with Hoffenheim in 2015, but scored just once in the 13 months before Nagelsmann was given the top job at the Wirsol Rhein-Neckar Arena. Since Nagelsmann: Uth has become an impact player par excellence, with five of his 24 Hoffenheim goals under Nagelsmann coming off the bench, with an assist thrown in for good measure. Uth has been used variously as Wagner’s replacement at No.9 as well as a withdrawn forward on the right, where he has space to unleash his lethal left-foot shot. No coach brings substitutes into a game earlier than Nagelsmann, meaning his players have time to adjust to a change in tactics. The where and the when no longer matter for Uth: under Nagelsmann, he scores, and Schalke have taken notice, signing him up for the 2018/19 campaign. Since Nagelsmann: One of Nagelsmann’s first acts at Hoffenheim was to install a back three; but how many coaches would shift their tallest, strongest centre-back out wide? With the help of the video wall at Hoffenheim’s training ground, Nagelsmann coached Süle into the role. Technology such as the Footbonaut refined the player’s touch and control, and the result was a defender who completed 89 percent of his passes last season, only committed 16 fouls in 33 games, and beat Wagner to Bayern by six months. Before Nagelsmann: A former Germany U21 central midfielder who, after a promising graduation to Bochum’s first team, failed to really make the grade there, or at subsequent clubs Augsburg and Cologne. A bitty operator in the middle of the park, Vogt picked up 12 yellow cards in two seasons with Augsburg before doing the same with the Billy Goats, avoiding relegation with the former by just three points in 2012/13. Since Nagelsmann: Vogt retains his propensity to leave a leg in, but he has nonetheless blossomed as a sweeper at the heart of Nagelsmann’s defence, with Benjamin Hübner, previously Süle, and latterly Stefan Posch either side of him. Attacks aren’t the only thing Vogt now initiates at the club, with his teammates appointing him one of the club captains last summer. Nagelsmann left the appointment up to his players. “Last year I set out the targets, but this year I wanted it to be up to the them, like the choice of captain," he explained. Nagelsmann certainly has a knack of carving his gems, perhaps because he is so well-rounded himself. The only coach to date who has signed up for Juan Mata’s Common Goal project, Nagelsmann is an intelligent, confident tactician who has the courage of his convictions. 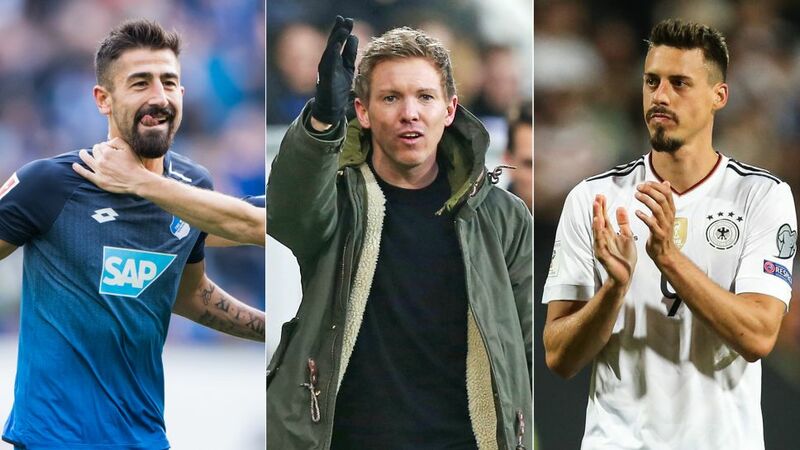 Some of the aforementioned have moved on, others have stayed, but all are better players for Nagelsmann’s influence. After a whirlwind two years from the Bundesliga’s youngest ever coach, it’s safe to assume many more will be saying the same by the time Nagelsmann, on one distant day, hangs up his laptop.